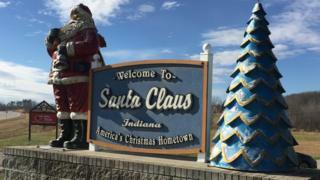 A town in the United States has been named Santa Claus since the 19th Century – so what is life like there? The south-west corner of Indiana is a normal American place with normal, American place names. And then, on the long, straight, Route 162, a road sign leaps out like a Christmas star. Santa Claus. Four miles away. It’s easy to tell when the four miles are up – a 10-foot statue of the man himself welcomes all-comers. There are other clues, too. The high street is called Christmas Boulevard. The main development – where most of the town’s 2,500 people live – is called Christmas Lake Village. In that gated community, which began in the 1960s, the main streets are named after the three wise men – Melchior, Balthazar, and Kaspar. Others roads are named after Rudolph’s reindeer – take a left down Prancer Drive and you hit Vixen Lane – while one street is simply called Chestnut by the Fire. In Santa Claus, Indiana, it’s Christmas 365 days a year. So do the residents ever get bored of it? In the 19th Century, the town was called Santa Fee. But, when residents applied for a post office, they were asked to pick another name – it sounded too similar to Santa Fe, 200 miles north. That much is fact – there’s a post office document from 1856 in the town’s museum to prove it. How they chose Santa Claus, however, is less certain. The best story goes like this. On Christmas Eve, the residents of Santa Fee tried to pick a new name. They sat round a potbelly stove when, suddenly, the doors blew open. A little girl, after seeing the doors open, heard bells. “It’s Santa Claus!” she gasped, and that was that. 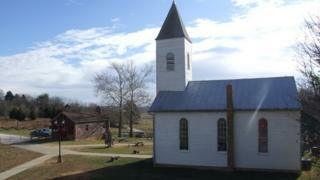 The alternative, apparently, was Wittenbach, after a preacher who visited the town on horseback. Santa Claus didn’t become a Christmas boomtown straight away. In fact, the new post office was given a fourth-class rating, due to the low volume of mail. But around 1914, they started receiving children’s letters to Santa Claus – and the town, led by postmaster James Martin, started replying. The post office now receives 20,000 letters every year, from all over America and the world. Most are addressed to the PO Box, but some envelopes simply say: Santa Claus, North Pole. The person in charge of replying is the Chief Elf, Pat Koch. She is 86, has degrees in nursing and theology (the latter earned aged 70), and brims with human spirit, not just Christmas spirit. Mrs Koch (pronounced Cook) leads a team of around 200 volunteers. They read the letters, take a printed reply, fill in the child’s name, and add a personal message. The Chief Elf admits she’s “very particular” about the replies. For example: the letter must be folded so, when the envelope is opened, Santa is seen first. It costs around $10,000 a year to send the letters. Some children send $1 or $5, but most of the cost is covered by donations, and sales at the museum. Six days before Christmas, two volunteers – Marti Sheckells and Joyce Robinson – sit in the old post office, writing replies. Marti, a retired teacher, makes a 120-mile round-trip, two or three times a week, to help out. It’s the magic of Christmas that brings her here, she says. As festive songs fill the air, lights twinkle above the fireplace, and Santa sends another letter, it’s easy to understand. Despite the name, Santa Claus isn’t a picture-postcard town. It’s dominated by a huge theme park called Holiday World and Splashin’ Safari, owned by Mrs Koch’s family. The park gets over a million visitors a year but closes in November for winter. It means that, in December, Santa Claus is surrounded by vast, lifeless car parks. There are models of Santa everywhere – outside the town hall, outside the post office – but it’s a normal town too. The town centre – Kringle Place – is another car park, surrounded by shops. Most have a Christmas theme, but there’s a Subway, a Dollar General, and other everyday stores. In truth, if you stand on Route 162 and wait to be struck by Christmas magic, you might be waiting a while. Round here, it’s the people – not the buildings – that fizz with festivity. The Santa Claus Christmas Store – which, like Holiday World, opens in May – sells row upon row of decorations and gifts. Customers wear Christmas hats. The smell of freshly-baked cookies drifts across the aisles. And, at the back of the store, is Santa Claus himself – living, breathing, and ho-ho-ho-ing. In Santa Claus, Indiana, the man with the red robes and white beard doesn’t play Santa. He is Santa. He starts working in the grotto in May. At this time of year, he’s there seven days a week. Everyone in the town calls him Santa, even in January. If they know his real name, they don’t let on. Has Santa Claus been found in Turkey? The beard is real, the hair is real, and – even when he’s wearing “normal” clothes – he’s happy talking to children about their Christmas lists. 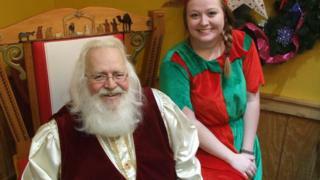 Michael Johannes – who’s also president of the town’s organising committee – tells a story about playing golf with Santa. Michael’s son – then aged six, now 31 – found the scorecard. Despite the theme park being closed, thousands of people visit Santa Claus in December. The museum’s visitors’ book has entries from Florida, Texas, Missouri and West Virginia in the past two days alone. 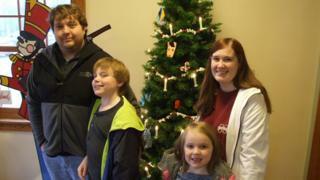 The Armstrong family – Ashley, Jon, and their children Brayton, 10, and Kaylee, 6 – have driven more than six hours from Tupelo, Mississippi, and are staying for four nights. “We’ve been to the candy shop, the toy store, we’re hitting everything,” says Ashley. Living in a town called Santa Claus does bring one or two problems. 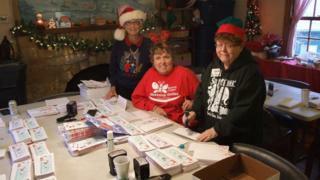 “When you’re ordering something on the phone, they ask for the zip code,” says Joyce Robinson, one of the letter-writing elves. But in general, the people of Santa Claus love living here. Let’s face it – if you don’t like Christmas, there are plenty of other towns to choose, like Jasper, or Boonville, or Dale. “There is an unwritten campaign,” says Michael Johannes. “Just about everybody’s home I go into has an ‘I believe’ sign. The last word – of course – goes to one man. “We have the real spirit of Christmas here,” says Santa Claus of Santa Claus, Indiana.